U.S. dairy exporters shipped 155,885 tons of milk powders, cheese, butterfat, whey and lactose in September, topping year-ago levels for the fourth straight month. Exporters continued to post gains in shipments of milk powder and whey products. Overall export value was $392.2 million in September, down 2 percent from a year ago, but the highest figure of the year (on a daily-average basis). 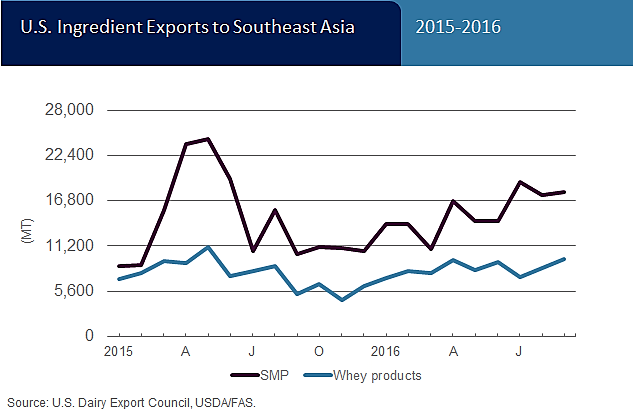 Sales of dairy ingredients to Southeast Asia have improved steadily throughout 2016. In the third quarter, exports of skim milk powder (SMP) were up 49 percent vs. year-ago levels, while shipments of whey products were up 16 percent. Increases in whey sales have been predominantly whey protein concentrate (WPC), which were up 48 percent in the third quarter. September exports alone were 5,116 tons, the most in more than four years. In contrast, exports of dry whey were down 4 percent in Q3, while exports of whey protein isolate (WPI) were down 10 percent. Within Southeast Asia, Indonesia has been the big buyer of milk powder in recent months. In the third quarter, exports of SMP to Indonesia more than doubled to 19,443 tons. Shipments to the Philippines, Malaysia and Vietnam were up 37 percent, 41 percent and 52 percent, respectively, compared with a year ago. 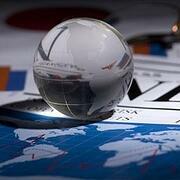 Exports of WPC to Malaysia and Vietnam increased significantly in Q3. Both bought more than 2,700 tons, compared with almost nothing from Malaysia and half that volume from Vietnam last year. Meanwhile, sales to the Philippines were up 10 percent. On a total milk solids basis, U.S. exports were equivalent to 14.7 percent of U.S. milk production in September, bringing the year-to-date proportion to 13.9 percent. Imports were equivalent to 3.7 percent of production, the lowest since April.